Despite his growing culinary stature, Jose Garces hasn't forgotten that those with gluten intolerance enjoy dining out too. The Philly-based Iron Chef has created dedicated menus for many of his restaurants, and even those that don't have a standalone bill of fare are able to accommodate gluten-free patrons. Distrito - the chef's chic Mexican restaurant in University City (3945 Chestnut St., 215-222-1657) - rose to the occasion at our recent dinner there. 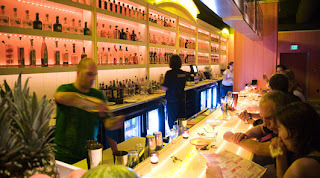 Distrito's glowing, pink-hued interior projected a modern feel from the moment we entered - Chi-Chi's this is not. We were originally seated in the rear of the second-floor dining room, but because it was drafty in our section, we moved downstairs to the more vibrant first floor alongside the bar. With the weather on the chilly side that evening, I opted to start with the spicy chicken tortilla soup, while my wife and kids settled on the fabulous costillas, short ribs atop corn masa flatbread with a three-chili barbeque sauce. 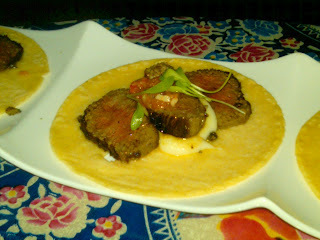 Everyone ordered tacos of their choosing; for three of us, it was a trio of flat-iron steak tacos seasoned in a tomato-horseradish marinade with truffle potatoes. Our younger son - he of the less adventurous palate - played it safe with chicken. 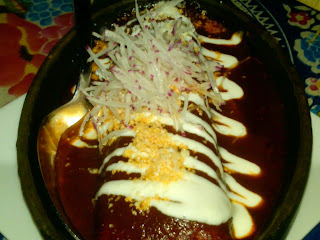 We also rounded out our protein quotient with a large chicken-and-chihuahua cheese enchilada and roasted pork tamales. We just couldn't pass up dessert. Notwithstanding the name, the four of us shared the "El Fuerte for Two." 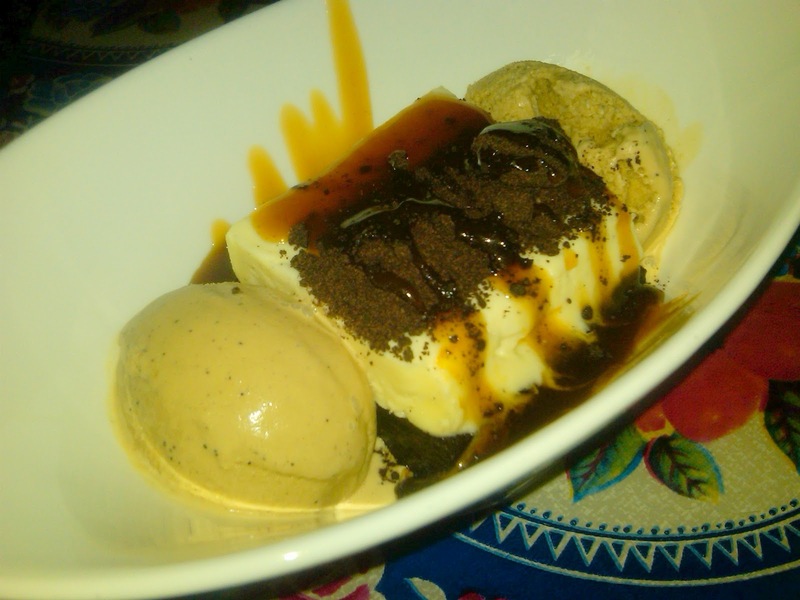 The sinful flourless chocolate cake was served a la mode with espresso ice cream and vanilla mousseline. Hmmm. We ate at Distrito a few weeks ago and when we were given their gluten free menu, the server (whose dad has celiac)was very careful with our choices, even from this menu. She alerted the staff that anything had to come from the dedicated fryolator and steered us away from things on the gluten free menu, so you must be vigilant!!! We ended up just asking for them to 'surprise us' with things that were absoutely gluten free, which shows that they weren't truly comfortable feeding us from this menu. As far as dessert, we also had the El Fuerte, however, those chocolate sprinkles shown in your picture were cookie crumbs or something with gluten, for we were advised that they would omit them for us. Note also that the back of the gluten free menu was the back of their regular menu and listed regular beer. Our meal was delicious and neither of us got sick, but it was a little crazy that the staff didn't even trust their gluten free menu. Me again. We went to Monsu for our anniversary and were assured over and over that gluten free was no problem at all. We went over the menu with our very knowledgeable server and ordered the multi-course Tourist menu with appropriate substitutions. The entire staff took great pride in presenting a dish, pronouncing it gluten free and apologizing for the lack (that night only)of gluten free bread, which neither of us cared about, but showed how gluten free accomdating they were. All was great until the entree my husband ordered came out with couscous instead of the GF pasta. It was a very saucy dish and the couscous was underneath everything. He happily ate away until I noticed the shiny gelatinous balls in his dish. I pointed it out, he put down his fork and we both looked around for our server. The maitre d' noticed us and ran over. He took one look at my husband's dish, gasped and removed it. While they apologized profusely, tried to give us a replacement entree and dessert to take with us, needless to say the evening was ruined. We didn't make a scene or anything, just requested the check, on which they comped my husband's meal. I paid the check and left a giant tip for the server who had been so solicitous, as it was not her fault, but the kitchen's, namely the chef who was overseeing the orders. While the chef also apologized, he asked us "Aside from the gluten, how was everything?" A little inappropriate for him to be looking for accolades at that moment. My husband's next few days were nasty, between joint pain, a fever blister and stomach pain. This wasn't inadvertant cross contamination, but a giant careless oversight in a restaurant that had lulled us into trusting them. Unfortunate. We have been to Distrito twice and got the tasting menu both times, the first time was the one with the food on the menu and the second we got the chef's choice. It was wonderful BOTH times. They were SO SO accommadating with the gluten intolerance and some food preferences (I HATE mushrooms and they gave us something else instead.) It was just all so good.